He also acknowledged misspelling the word “eyes” when replying to the same letter, recalled Frankie Carnes, chairwoman of the Belmont County Board of Elections. Carnes was among those in the Ohio Valley who were remembering America’s 41st President on the eve of his funeral. Bush died Friday in Houston. Carnes was so emotional following Bush’s loss in the 1992 election that she penned him a letter telling him her thoughts. “I told him how proud I was of him, and of what he did for the country,” she said. Her husband, then Ohio Sen. Jim Carnes, R-St. Clairsville, hand-delivered the letter to Bush during a fundraiser both attended late in 1992 in Cleveland. “That same night, he wrote me a note back,” Frankie Carnes said. Bush had penned the note on Air Force 1 stationary. He told her in the note that her letter “had brought tears to his eyes.” But a line was drawn through the word “eyes,” which Bush had misspelled and then corrected. Carnes still has the note at her home in St. Clairsville. Carnes also had fond memories of Bush’s wife, former first lady Barbara Bush. Carnes was invited to a luncheon in Washington thrown by the Barbara Bush, and she had the opportunity to speak with her candidly as the first lady posed for photos. Jim Carnes said he and Frankie were fortunate to meet the Bushes on a number of occasions. He remembered the time he and Frankie had the opportunity to meet Bush at the home of billionaire businessman Les Wexner in New Albany, New York. Another time, he was one of six Ohio leaders asked to meet Bush on the tarmac when he flew in for a visit to Columbus as President. 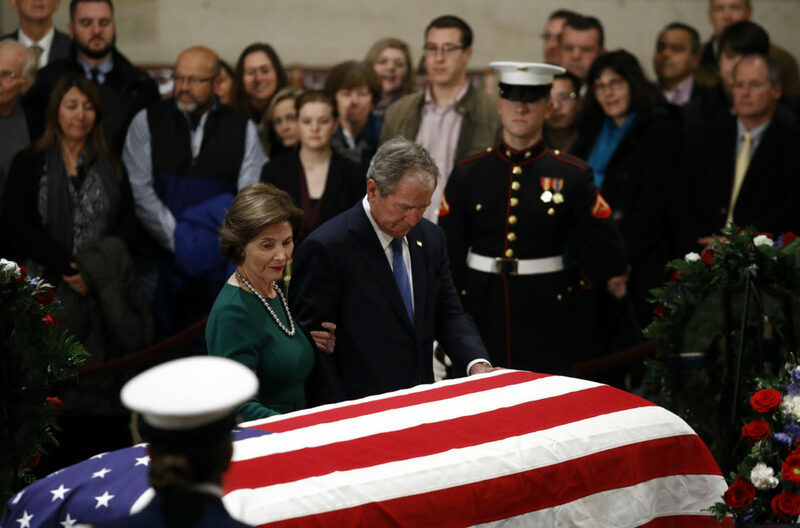 “He was such a wonderful, gracious person,” Jim Carnes said of Bush. He believes history will be kind to the 41st President. Wheeling Mayor Glenn Elliott said he met Bush while working as an attorney in Washington, D.C., in 2001. His law firm threw an inaugural party for Bush’s son, the newly elected President George W. Bush. The new president’s parents attended the party. Elliott said Byrd “was much harder on” the Democrat President Bill Clinton than he was on the Republican Bushes or Ronald Reagan — who was closer to his age. Bush and Byrd worked together to achieve a deficit reduction bill, that was likely a factor in Bush’s not being re-elected in 1992, according to Elliott. U.S. Rep. David B. McKinley, R-W.Va., said he met Bush twice while serving as the chairman of the West Virginia Republican Party. The second meeting came at the end of McKinley’s tenure as chairman, and Bush had an aide present him with a gift. McKinley also believes history will be kind to Bush. Bush was soundly criticized after the Gulf War when he didn’t direct American soldiers to go in and take Baghdad. Some say the action might have averted current conflicts in the Middle East. “He knew he had the power and military might to do it, but it wasn’t the agreement he signed,” McKinley said. “You have to be respectful of someone like that. His word meant something. “Yes, we have had to deal with problems since then, but he had to stick to it,” he said. Senior U.S. District Judge Frederick P. Stamp, of Wheeling, was appointed to the federal bench by Bush in July 1990. “The one memory I have about that process is that President Bush called me to advise me he was going to nominate me,” Stamp said. “That was a singular honor in itself. I understand he did that with all judges he nominated, and I very pleased he called me. Stamp termed Bush “very gracious” in telling him he would nominate him to be a judge in the federal court. “He had taken the time to call me in the middle of a budget controversy he busy with that at the time,” Stamp said. “I remember thinking it was extraordinary he did that at that time.